Clothe yourself in it (Col 3:14). Fill yourself up with it (1The 3:12 and Php 1:9). Be sincere in it (2Cor 8:8). Be fervent in it (1Pet 4:8). Stimulate it in others (Heb 10:24). Which items on the list are easiest for you? Which are most difficult? For a summary of 1Corinthians, see the Book Summaries page, Bible Books: New Testament. 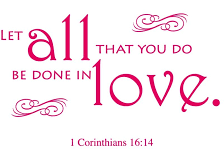 This entry was posted on Wednesday, February 14th, 2018 at 5:04 am	and tagged with 1Corinthians, be done in love, love and posted in Demonstrate Core Values. You can follow any responses to this entry through the RSS 2.0 feed.